Initiation of motion is the threshold at which sediment particles start to move in open-channel flow. This threshold is important in channel design in order to assure sediment movement and avoid clogging. The Froude number F = 0.08 has often been taken as a minimum value to prevent clogging. Herein we derive a general Froude criterion for initiation of motion, confirming the validity of F = 0.08 for a wide range of practical applications. in which τo = bottom shear stress, γs = specific weight of sediment particles, γ = specific weight of water, ds = sediment particle diameter, and τ*c = dimensionless critical shear stress. 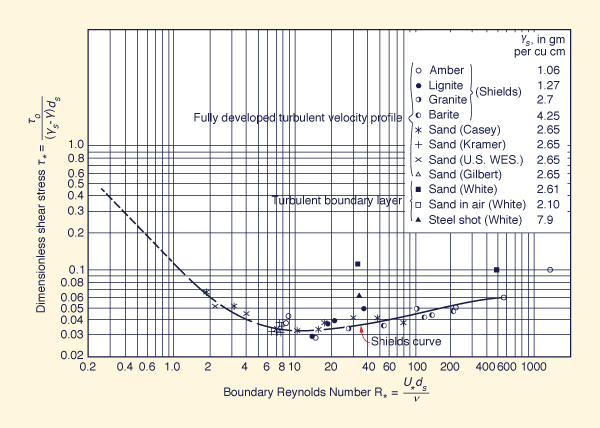 For practical applications, the dimensionless critical shear stress τ*c can be taken as a constant for a wide range of boundary Reynolds numbers R*. in which ρ = mass density of water, f = friction factor, equal to 1/8 of the Darcy-Weisbach friction factor fD, and v = mean velocity. in which g = gravitational acceleration and d = flow depth. in which g = gravitational acceleration, n = Manning's n, R = hydraulic radius, and k = a constant equal to 1 in SI units and 1.486 in U. S. Customary units. in which d and ds are given in ft. The Shields criterion is expressed in terms of the Froude number, enabling the calculation of the minimum Froude number for initiation of [bed material sediment] motion in open-channel flow. Given critical dimensionless shear stress, friction factor, and relative particle diameter, the developed relation confirms the validity of Froude number F = 0.08 as a convenient descriptor of initiation of motion in most cases of practical interest. 1 Ponce, V. M. 1989. Engineering Hydrology, Principles and Practices. Prentice-Hall, Englewood Cliffs, New Jersey. 2 Ponce, V. M., and D. B. Simons. 1979. Shallow wave propagation in open channel flow. ASCE Journal of the Hydraulics Division, Vol. 103, HY12, 1461-1476.